Between 1998 and 2005 the average annual P/E ratio of General Electric (NYSE: GE) stock was around 28x earnings. At that price you can have the bluest of blue chips and it wouldn’t matter a jot because it is almost certainly guaranteed to result in sub-par investment returns over the medium term. It doesn’t matter that the business was firing on all cylinders at the time, with shareholders seeing earnings-per-share rise from $0.93 a share to $1.72 per share (equivalent to an annual growth rate of 13%), whilst the annual dividend rose from $0.42 per share to $0.91 per share (equivalent to an average annual growth rate of 16.7%). In other words it did everything you could possibly want from a mega-cap blue chip dividend stock during that period. The bad news was that between those two dates you barely saw anything by way of shareholder returns. The roughly $35 a share that folks were paying at the end of 1998 was worth the same by the end of 2004. Not surprising given the P/E multiple contracted from 30 to 20 over a seven year stretch. Indeed the only returns they saw in that period were the $3.45 per share paid out in cash dividends in the intervening period – not even enough to match inflation. This is a point not mentioned nearly enough with blue chip stocks in that it can literally take years for any given one to get to a suitably attractive value. I liken the experience of General Electric to Coca-Cola in that it basically took a decade to find the shares trading at the sweet-spot value where you can all but guarantee that earnings-per-share growth, dividends and some P/E multiple expansion will work in your favor. In the case of Coke that occurred as it became a general victim of the financial crisis induced bear market. The trade-off for the economic and stock market volatility was that if you managed to build a position around the Q1 2009 bottom you got your hands on the shares for under 13x forward earnings with a 4.3% annual dividend yield. The idea that an income investor can get their hands on such a high quality asset at that price is so attractive because they get to see the bear market accelerator in full swing. In the seven years since then their yield on cost would be around 9.5% if we assume the $8.72 paid out in cash dividends were reinvested along the way. On a $50,000 investment that’s $4,750 in annual income this year for holding a company whose products are consumed at a rate of 1.8 billion servings per day. With General Electric you had a more direct issue with the underlying business because GE Capital (the finance arm of the company) caused mayhem during the financial crisis. The attractiveness of the credit division was that it generally earned much higher returns than the industrial side of the business whilst simultaneously providing high levels of growth. Specifically, you had the unique relationship between GE Capital and the main company that allowed them relatively cheap borrowing costs versus pure-play financials (and also lower interest rates to customers that competitors couldn’t match). They could afford to hold less capital on the balance sheet without affecting their credit rating for the same reason. The downside is that you end up taking on the same risks you get with any finance stock; namely that recessions and downturns can potentially leave you incredibly vulnerable in a way that other blue chip stocks don’t. The irony of that is that it took a period of intense pain and volatility to provide a great long-term entry point. If you lookup the share price at the start of 2009 you will find the stock was trading at something like $16 a share versus the $40 a share it was at the 2007 peak. Even with the dividend shredded in half as profits collapsed you were looking at a yield of around 3% and a forward P/E ratio of under 14x. It didn’t stop the stock losing a further 60% of its value over the following couple of months, but an investment made then has still managed to deliver 12% annual returns with a current year yield on cost of around 7% (assuming reinvested dividends). Needless to say if you were buying shares around the $6-$7 mark that was on offer in March of that year then you’ve enjoyed spectacular returns to date (approximately 25% compounded annually along with a current 17% yield on cost). Now that we’re entering a post GE Capital era where does the stock stand today? Essentially the company will have sold off virtually all of the finance arm by 2018, with only the segments directly related to industrial side of the business remaining. Basically it will go back to being a mega-cap industrial stock rather than a mega-cap hybrid bank as the profit mix will end up being something like 90/10 in favor of the industrial side of the business versus the 50/50 it was in the years leading up to 2008. I find that to be attractive from an income investing point of view as it puts the stock back into the stodgy category and removes the volatility of the credit cycle. In return the company is using the proceeds to reduce the share count from 10 billion to below 9 billion. What’s a good price to pay for that trade-off? Well, in terms of what to expect by way of returns it’s helpful to project some future P/E ratios as a guide. As it stands the stock trades at $32 per share on 2016 earnings estimates of $1.50 per share, along with a $0.94 per share dividend. To get to a P/E ratio of 15x earnings in 2021 would require annual earnings growth of 7% assuming the stock price doesn’t change. 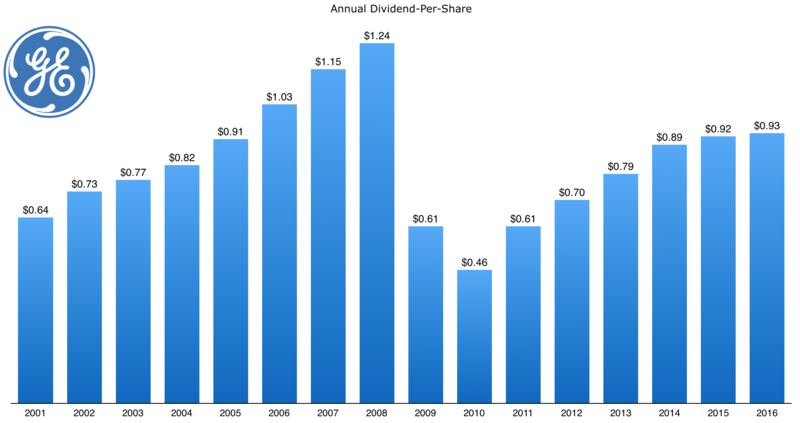 If you take management’s $2 per share 2018 earnings forecast at face value then you might be able to say the stock is, at a stretch, somewhere in the fair value range once you chuck in a 3% dividend yield.